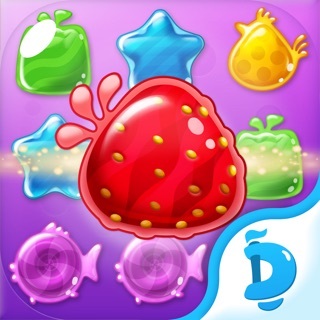 Bake scrumptious desserts and cakes from all over the world in this top rated FREE ADDICTIVE time-management game! * More than 50 desserts and drinks to prepare - Cookies, Cake, Hot chocolate, fruit salad, ice cream sandwich, cotton candy, fudge, Ice Cream Cone, Apple Cider, Coffee, Lemonade, Italian soda, Baklava, Waffle, Apple Pie, Gulab Jamun, Cheesecake, Sundae, Pudding, meringue pie, panna cotta, Alfajores, Mochi, Lassi, Macarons, Volcano rice crispies, S'more martini, Brittle, Smoothies, Beignets, decorated wedding cakes, smoking mocktail and many more delicious items. * 24 different locations with it's unique cuisines - visit Lemonshine Orchard, Swiss Chocolate Alps, Cherryglow Forest, Fruitful Fields, Eclair Academy, and many more places. New locations are on the way! 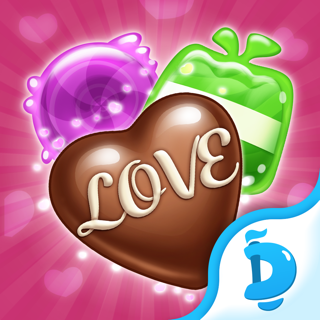 * More than 550 levels to complete, and more added regularly. * More than 20 unique and quirky customers that never stops to surprise you. * Over 100 upgradable kitchen appliances for you. Finagle the fun twists introduced by new customers like the handsome Beekeeper, the oh-so-punctual Clockmaker, and the terrifying Queen! Learn your customers’ favorite foods to know them better than they know themselves! Upgraded Ingredients and Stations make your bakery a well-oiled machine and help you keep up with the outrageous demand for your scrumptious sweets. 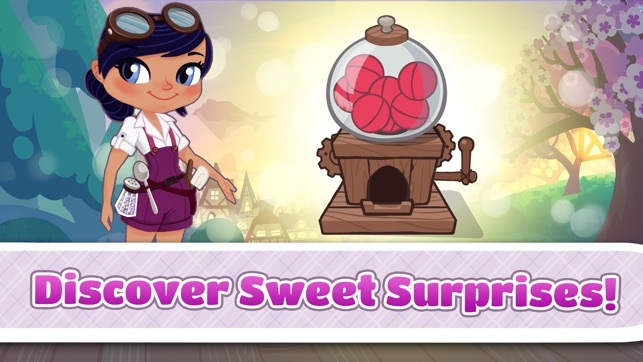 Earn Star Tickets for traveling to distant Lands to unravel mystery story! 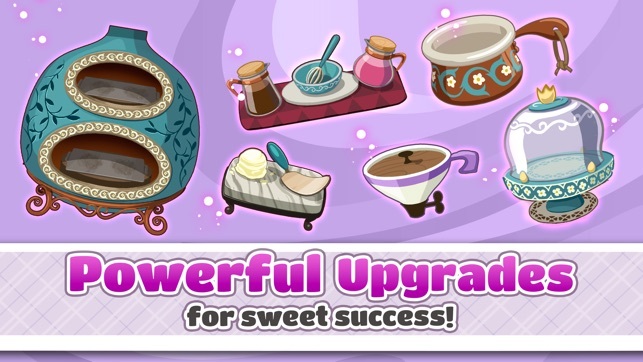 Tap into the magic- use potent Power-Ups to speed up your stations, placate your patrons and multiply your moolah! 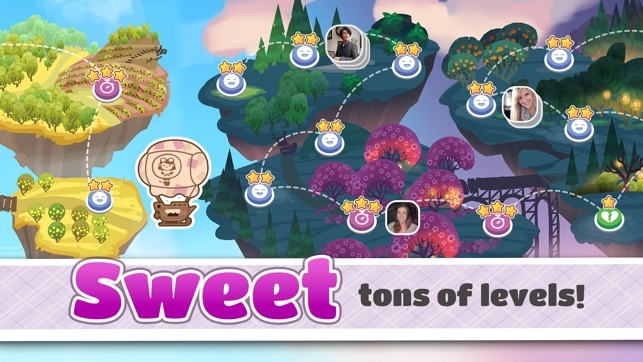 Help Sugar restore sweetness to the world as you explore hundreds of levels in mystical fantasy lands. 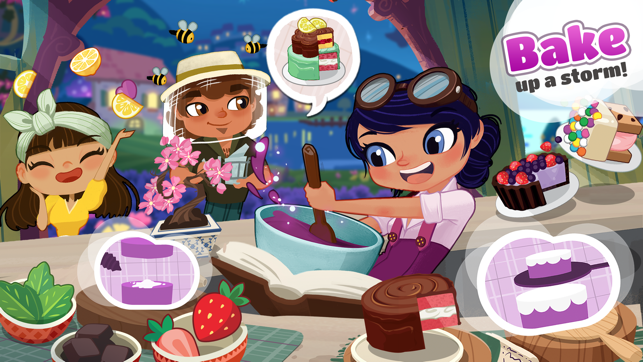 Each land is bursting with fresh, unique ingredients and magical new tools for your bakery! Every level brings you closer to defeating Baroness von Bitter’s evil curse! FREE GIFTS FROM YOUR FRIENDS! Connect to Facebook to compare scores and exchange free gifts to advance faster and farther in the game! 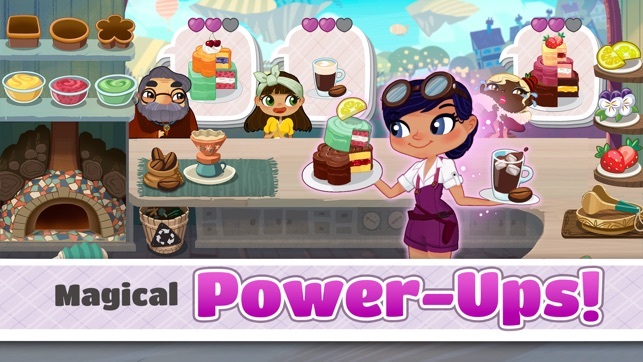 In conclusion, this is a FREE entertaining cooking strategy time-management game to bake cake, pastries, many desserts and to make exotic juice drinks too. Engrossing game-play that will keep you hooked to this restaurant simulation for a long time, an academy where one could learn essential 'Cooking and Baking 101: Making Cakes and Cookies' in a fun way! IN-APP PAYMENTS: Bakery Blitz is free to play, but you can buy special items to use in the game. Before you download this experience, please consider that this app contains social media links to connect with others, in-app purchases that cost real money, advertising of PopReach products and products from select partners and push notifications to let you know when we release exciting new content. REVIEWS: Please rate Bakery Blitz and leave us a review! We love hearing from our fans! Keep updated on new features and game hints: https://www.facebook.com/bakeryblitzgame/. Like us on Facebook: https://www.facebook.com/games/bakeryblitz/. I’m a huge fan of cooking games and in particular really enjoy the RockYou games. However, Bakery Blitz can be quite problematic at times. My biggest issue with it is that on timed levels, there are extremely long pauses between customers, no matter how quickly you serve the food. This is not the case at all in RockYou’s other game- Kitchen Scramble- in which new customers show up right away after you complete an order. When there are 3-4 spots for customers, each spot should be filled pretty consistently. However, there are some times on those levels where one of the potential spots is only occupied once or is not occupied at all throughout the whole level. It’s extremely frustrating when you cannot pass a timed level simply because there is a 10 second pause (or more) between customers in one of the 3-4 open customer spots. This doesn’t seem to be an issue on levels where you try not to lose customers, where you actually want some spacing, so I know this issue can be fixed. Give us more customers! Be like kitchen scramble! We are glad you are enjoying the game. We appreciate your comment! Cute, but full of bugs. This game is super super cute! Probably one of the best baking games I’ve ever played. However, there are many bugs and glitches. And I know it takes time to fix these things. But I’ve been playing this game for a little over a year now and I would end up taking long breaks from it because certain levels were glitching, or the tasks weren’t completing. I would waste much energy and time trying to complete these, only to but left frustrated. (I would include money, but I’ve never personally found it really worth spending the money unless they have good deals. I like that they give you free energy for a specific time but, I don’t have 2hrs+ to waste the energy for so little crystals.) I like the events that were added, but those glitch worse. I’ve wasted 4 gold coins on this recent one just trying to play one level and it never even started. Thank you for the wonderful feedback. We appreciate your comments. We appreciate feedback, both critical and positive, from our players as your opinions mean the most to us! I can pass on your feedback to our developers and let them know that the players are having some difficulties finding satisfaction within the game. Though, as you may know, we cannot guarantee an immediate change once we receive your feedback or suggestion. The Development team is listening and taking your suggestions to heart when looking to create, implement or improve new/existing features. Cheers!